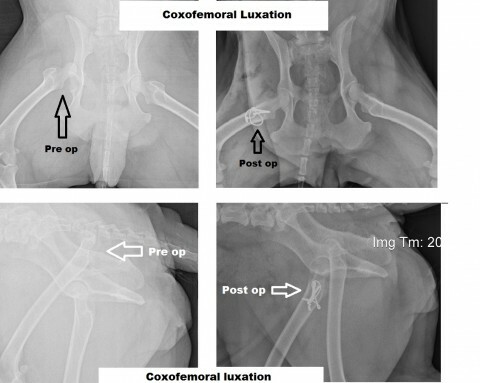 Considerable attention has been given to the topic of coxofermoral luxation in the dog primarily because hip luxation is a relatively common traumatic injury encountered in small animal practice. Hip luxation is a relatively common traumatic injury encountered in small animal practice. Hip luxation is usually the result of blunt trauma with resultant disruption of the joint capsule and ligament of the head of the femur. The low incidence of hip luxation in dogs less than one year of age is due to the fact that the femoral capital epiphysis fuses to the femoral neck at about 11-12 months of age and that, prior to this time, trauma is more likely to cause a femoral epiphyseal separation. Numerous studies have indicated that a unilateral craniodorsal luxation is the most common injury seen. The diagnosis of hip luxation is easily made upon physical examination and confirmed with survey radiography. While the affected limb may be held elevated, many patients will bear weight on the limb with the toes rotated laterally. Craniodorsal displacement of the greater trochante is evident as a noticeably increased distance between the trochanter and the tuber ishium, and a thumb held between these bony prominences will not be displaced laterally when the hip is rotated externally. Crepitus is usually detected upon palpation of the joint, and the affected limb will appear shorter than the contralateral limb when the dog is placed on its back and the limbs are extended caudally. Pelvic radiography will confirm diagnosis and demonstrate if there is the presence of pre-existing hip dysplasia or degenerative joint disease or concomitant injuries such as fractures of the femoral head and/or acetabular rim, all of which have a profound impact on the method of treatment selected and the ultimate prognosis. Numerous techniques have been advocated for treatment of canine hip luxation. Closed reduction is the procedure of choice upon initial presentation of a patient with hip luxation if the luxation is not complicated by acetabular fracture, an avulsion fragment, or failed previous reduction. Closed reduction should be attempted as soon as possible after the injury, as there is a poorer prognosis for maintaining closed reduction if it is attempted more than 4-5 days post trauma. Maintenance of closed reduction may be achieved with application of a non-weight bearing Ehmer sling or insertion of a DeVita pin. Several studies have indicated a high failure rate associated with closed reduction and application of an Ehmer sling and so my personal preference is insertion of a DeVita pin. While sciatic nerve damage has been associated with this technique, in my experience, if the proper placement technique is utilized the danger of vital tissue injury is minimal. If stability is inadequate following closed reduction or if closed reduction can not be achieved, open reduction is indicated. The presence of osteochondral fragments, acetabular fractures, inversion of the joint capsule into the joint space, and the presence of debris (hemorrhage, fibrin, fibrous tissue) within the acetabulum, may preclude successful closed reduction. 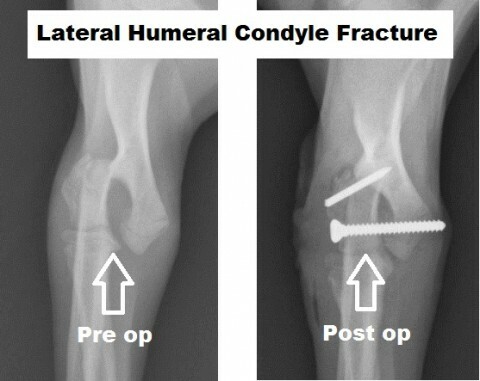 Another indication for open reduction is the presence of multiple orthopedic traumas where there is a need for immediate stable weight-bearing ability on the affected limb. A number of surgical techniques have been described for management of hip luxation in the dog. These include replacement of the ligament of the head of the femur (transarticular pinning, toggle pin), extension of the acetabular rim with bone grafts or implants, reconstruction of or substitution for a damaged joint capsule (capsulorrhaphy, extracapsular suture stabilization), and the creation of extramuscular forces around the hip joint to maintain reduction (translocation of the greater trochanter). A combination of techniques may also be utilized in an effort to save the hip in difficult cases. In cases exhibiting an acetabular fracture, a significant avulsion fracture of the femoral head, pre-existing hip dysplasia, and/or the presence of degenerative joint disease, excision arthroplasty with a biceps sling or total hip replacement may be indicated. While all of these procedures have their inherent advantages and disadvantages, my procedure of choice for surgical treatment of canine hip luxation is capsulorrhaphy with trochanteric transposition. This technique is relatively simple to perform and avoids the potential complications of some of the other techniques including injury to vital structures, implant migration, pin breakage, foreign body reactions, and interference of implants with articular surfaces. Capsulorrhaphy with trochanteric transposition requires an adequate amount of intact joint capsule in which primary closure may be achieved and intact gluteal musculature to achieve internal rotation and abduction. Ideally, the joint capsule should be reconstructed and the greater trochanter advanced caudodistally to a decorticated bed while the hip is maintained in reduction, flexion, abduction, and internal rotation. In some hip luxations, the initial trauma may have resulted in extensive damage to the joint capsule and surrounding tissues such that a secure capsulorrhaphy cannot be performed. In these instances, extracapsular suture stabilization should be implemented to provide additional support during healing of the joint capsule. In most cases, a good prognosis is warranted for return of limb function when successful closed or open reductions are maintained post-operatively. Utilizing open reduction with capsulorrhaphy and trochanteric transposition as described above, early weight bearing ability is achieved and the technique offers an excellent chance of restoring a highly functional reduced hip joint without significant risk of complications or need for implant removal.